I like to include graphics in some Microsoft Word documents. They often help illustrate technical examples. The problem for me was I could never quite figure out word wrap. On occasion, I even used tables to do layout by dropping the picture in a cell. In retrospect, this tip probably seems obvious. Previously, I would write a paragraph, insert my picture, and continue writing. The problem with this “start stop start” approach is it harder to see the effect of your text wrapping styles. If you insert your graphic later, the changes are easier to see. I chalk this up to being part of the generation that edits as they write and immediately applies formatting. If it helps, just put a placeholder on your doc such as [image 1] and insert the picture later. This doesn’t mean you have to write the entire document, but just enough text after where you want the graphic to appear. The second key for me was to use Word’s Picture toolbar instead of the Format Picture dialog. The toolbar may already be docked. If not, you can reach it by right-clicking a picture. The toolbar has a button that looks like a dog behind lines. 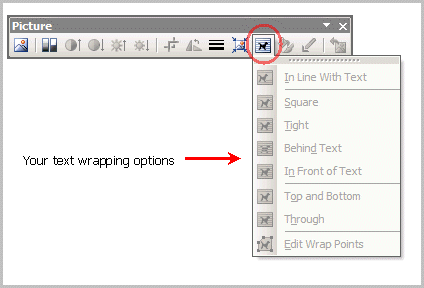 When you click this toolbar button, a series of text wrap options display. Hopefully, you’ve got some document in mind where you can use this feature. If not, you can easily create a test document. Open a new document. If you just want to play with this feature, type =rand(2,5). This function creates 2 paragraphs of 5 lines of random text. Choose the picture you wish to insert. Right click the picture and select Show Picture Toolbar. Click the Text Wrapping button. You should see your text wrap around your picture. You can drag the picture to reposition and the text will reflow. If you don’t see your text wrap around your image, your picture may be too big. Try resizing the picture so it’s small enough that text could wrap around it. You can do this by clicking the picture and dragging the lower right corner towards the top left.